The side guide is micro metrically adjustable providing convenient adjustment for narrow blades. The saw wheels are laminated with rubber for accurate blade tracking and slippage prevention. The table is made of cast iron and the surface is precision ground. The table can tilt to a maximum of 45 degrees front downward for bevel cuts. Blade tension can be conveniently adjusted by means of a band wheel. A tension scale allows the operator to correctly adjust the tension for different blade widths. The cast iron top and bottom saw wheels are precision machined and dynamically balanced for smooth running. The see through guard provides operator safety and protection. The foot brake permits the quick shut down of machine operations. 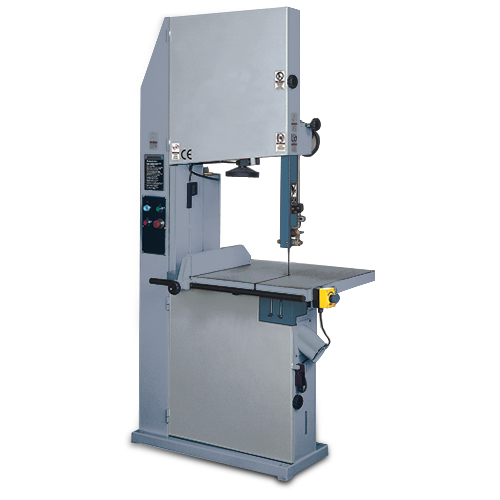 The heavy gauge steel frame ensures stable and vibration-free cutting. 4″ diameter exhaust chute supplied as standard. The foot brake permits the quick shut down of machine operation. A foot pedal allows feeder fast swing away.